LOUISVILLE – Despite being part of the same church family, Hazel Pflugmacher and Jaquette Easterlin never met. The place Pflugmacher and others helped create was in a dingy, old church basement in Tacoma, Washington, where Easterlin now works. In 1987, the year Easterlin was born, Trinity Presbyterian Church was down to 25 members — in a neighborhood caught in the crossfire of drug trafficking, gang violence and poverty. Built in 1922, the church was near Bryant Elementary, which, at the time, had the highest free and reduced lunch enrollment in Tacoma. 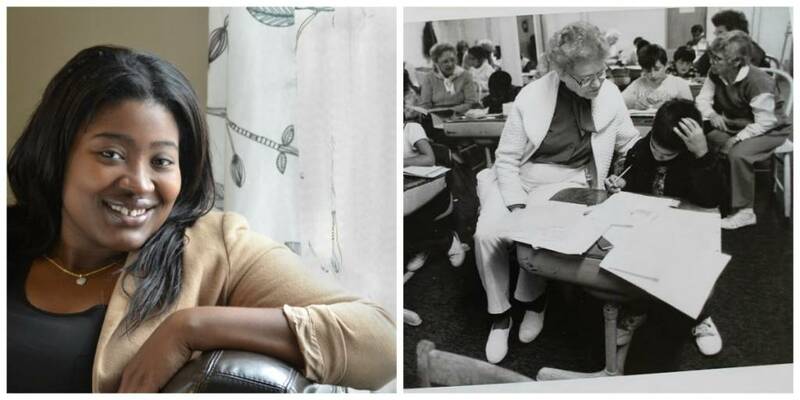 Pflugmacher — one of Tacoma’s first female school principals — was told by her friend, the principal of Bryant Elementary, that the school needed help. Eighty years old at the time, Pflugmacher recruited other retired schoolteachers. Together, with other Trinity members, they started a reading and mentoring program for first- and second-graders at Bryant, the one Easterlin came to six years later. 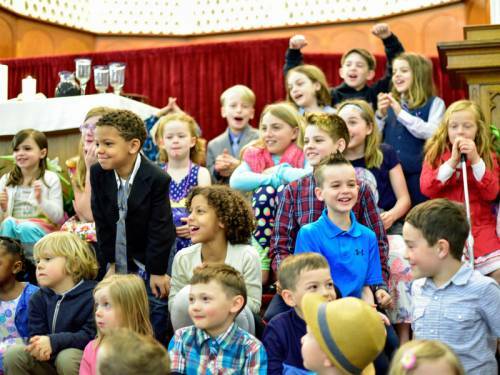 The Bryant after-school program was a turning point for the church. As children came to Trinity, relationships began to form with others in the neighborhood, and that led to a weekly soup and conversation ministry. “The seeds for resurrection were planted — and they have blossomed,” said Trinity’s current pastor, the Rev. Matt Robbins-Ghormley. By the early 1990s, with the help of University Place Presbyterian Church, Trinity added a medical clinic for those without health insurance. Easterlin’s grandma took her there when she needed health care. “It was this incredible group of older adults who thought they were young,” said Kevin Hunter, whose family with small children was one of the first to join Trinity in the early ’90s — and experienced the turnaround. When he moved to Tacoma, Hunter bought a house in “the Wedge,” two blocks from Trinity. That was significant because the Sixth Avenue side of the street cut through Tacoma’s north and south addresses. The other side was Division Avenue — the technical line of demarcation. Impressed, Hunter and his wife, Kim, went to two other young families, with two or three kids each, and asked them to come to church with them. Suddenly the membership had increased by six adults and seven to nine children — and tripled the youth group. Hunter initially worked for Young Life urban ministries — and then for World Vision, which awarded a $100,000 vision grant to cover work being done in the neighborhood by Tim and Anna Herron, who had started a learning center for kids in their garage. The Herrons, educators involved with InterVarsity Christian Fellowship, didn’t start attending Trinity until 2000, when their then-University Place associate pastor, the Rev. Harlan Shoop, became Trinity’s pastor. What would become Trinity Learning Center at Jason Lee Middle School was initially open to the kids they knew — including Easterlin, who lived five houses down from them. Stepping out of her house one night, she saw someone getting jumped in the alley. Thinking it was a family member, she ran towards the Herrons’ home. She remembers telling Anna to call 911, and being held while she was on the phone. She also remembers later feeling lucky that her family wasn’t harmed. In 1998, with the help of the Northwest Leadership Foundation, the Herrons created structure and funding for ActsSix scholarships for promising urban leaders. Easterlin received one of the scholarships to Whitworth University. Now, she is Trinity’s learning center coordinator, providing homework help, study skills, teacher advocacy and adult mentoring to students at Jason Lee Middle. Despite not wanting people to know she was struggling with reading — or that she needed free lunch and medical care — Easterlin is grateful for Trinity providing a place of refuge for her. “I was accepted there. I didn’t have to worry about anything else,” she said. “It’s the same for kids today. I try to create fun for them and keep them focused in the moment. Trinity’s membership is now over 200. 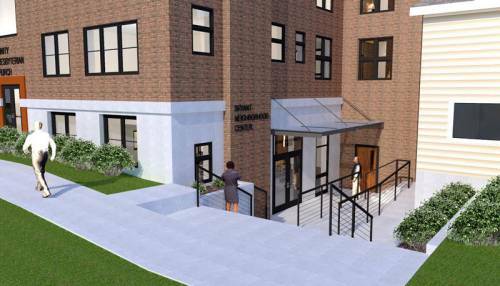 In April 2019, construction will begin on a new Bryant Neighborhood Center in the church basement, which is part of the $4.7 million “Here for Good” campaign. The church has received $1.16 million in pledges from Trinity members and another $1.5 million from community partners, including an anonymous $1 million gift. To see the impact of Trinity’s ministries to the neighborhood, watch the video below, or for a description of each, click here.